Bouchillon Performance Engineering offers complete drivetrain kits for Gen II and Gen III installs into most classic and modern muscle Mopars. These kits will come complete as you need them to be, to make that dream a reality. Bouchillon Performance Engineering can offer you any size Gen II or Gen III Mopar powerplant you want and all the parts you need for a complete install such as transmission, motor mounts, rear end, brakes, pulleys, a/c lines, alternator, starter, exhaust system and engine controller. Bouchillon Performance Engineering also offers in house installs on that job you are just not ready to do yourself and need help from professionals. Give Bouchillon Performance Engineering a call to consult with their sales staff on your options or send an email to Randy via our contact page. Above is an example of what Bouchillon Performance Engineering offers as a complete, ready to go, drop in powertrain kit. 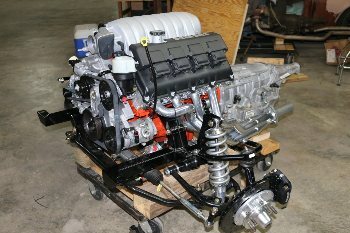 Mopar 6.1L Gen 3 Hemi complete, Mopar 545RFE Transmission, TTI headers and a RMS AlterKation front end kit. All the way down to the last bolt and nut. Many Options to choose from. Questionnaire One covers Small Block A-Engines, B / RB Engines, Gen II 426 / 472 / 528 / 572 Hemis, and Vipers. 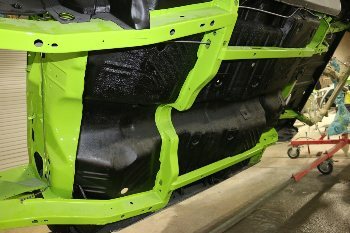 Questionnaire Two covers Gen III Hemis, 5.7L / 345, 6.1L / 379, 6.4L / 392, and 7.0L / 426 with all the options from the front bumper to the back. Usually, most Drivetrain Kit Quotes take a day or so to put together. Please fill out completely. Remember, we do not know anything about your project unless you tell us. Since we do so many of these, with all of your answers to our questions we may be able to suggest an easier or less expensive route than you were thinking. "How did we get to being one of the leaders in the Industry for Gen III Hemi's" you ask? Well, we completed our very first 5.7L Gen III Install in January 2003. From then until now, we have already made most of the mistakes and resolved them, so you do not have to! That is the true definition of engineering.